In a time-tested tradition as part of First 5 LA’s 2015-2020 Strategic Plan update, the Board engaged with staff and experts in two breakout sessions to learn about and discuss the systems change and policy framework in two emerging strategies: Trauma and Resiliency-Informed Systems Change (TRISC) and the Built Environment. In this unique Commission meeting, First 5 LA Vice President of Programs Christina Altmayer began by reviewing how the 2015-2020 Strategic Plan is embedded with a systems change and policy framework, reducing an emphasis on funding direct services and increasing the emphasis on systems change, collaboration and public policy. This work by its nature is multi-sector, multi-issue and multi-dimensional – requiring research, understanding of current systems, partnership development, planning, time and patience. Research reveals that exposure to trauma in childhood is associated with long term issues into adulthood, including anxiety, depression and PTSD. As a new area of focus for the agency, First 5 LA has teamed up with the California Community Foundation, the Ralph M. Parsons Foundation, and the California Endowment to launch a trauma-informed care systems change initiative with the commitment of more than 30 public nonprofit and philanthropic partners. By creating a trauma-informed county, services and systems are more aware of the pervasiveness of trauma, responsive to people who have experienced trauma and actively work to resist re-traumatization. During the breakout session on TRISC, Board members were joined by First 5 LA Health Systems Director Tara Ficek and John G. Ott, co-founder of the Center for Collective Wisdom. The discussion brought out a number of personal reflections of childhood trauma: Ott himself experienced the individual trauma of homelessness as a child. Commissioner Deanne Tilton, who also serves as the Executive Director of the Los Angeles County Inter-Agency Council on Child Abuse and Neglect (ICAN), recalled her own childhood dealings with trauma. Even those trying to help others overcome trauma can be impacted by the stressors involved, said Commissioner Brandon Nichols, who also serves as the Acting Director of the Los Angeles County Department of Children and Family Services (DCFS). Nichols also cautioned against allowing a trauma and resiliency-informed systems change approach to fall prey to “initiative fatigue” that can occur when a new social health success initiative seems to crop up every month. “Trauma should not be seen as the ‘flavor of the week’ or it will die on the vine,” he said. Meanwhile, First 5 LA continues to meet with other partners in the TRISC work group, which has gathered seven times and drawn 80 participants during the last year alone. In terms of next steps, First 5 LA will continue to engage with funders and systems leaders to advance this movement to create a trauma and resiliency-informed Los Angeles County. There will be potential learning events and a countywide summit in the fall. Indeed, the effort to impact systems change - to use another plant metaphor – is taking root all over Los Angeles County. “There is not a place in the county we have gone where this conversation is not happening today,” Ott said. In a separate session, Commissioners engaged in a discussion on First 5 LA’s Built Environment strategy with Communities Director Antoinette Andrews, as well as Prevention Institute’s Managing Director Manal J. Aboelata and Director Elva Yañez. A community’s physical or “built environment” includes the condition of housing and schools, safety of its streets and parks and other environmental factors that act as barometers of residents’ health. 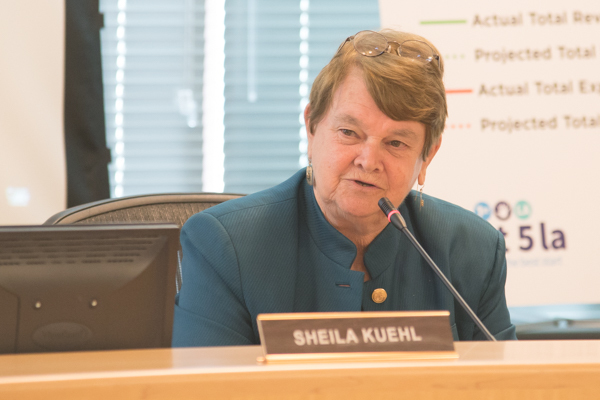 Commission Chair and Los Angeles County Supervisor Sheila Kuehl recalled a time from her childhood when entrepreneurs made the difference in her family’s access to healthy food. “We have an opportunity at First 5 LA because we have 14 Best Start Communities thinking about what they need,” Kuehl pointed out. Indeed, First 5 LA has sponsored a number of workshops and trainings since 2015 in Best Start Community Partnerships on built environment issues such as park equity (with the Los Angeles Neighborhood Land Trust) and transportation. These trainings build the capacity of residents to reverse current inequities in these areas, often connecting them with elected officials and public agency staff. Additionally, Best Start Community Partnerships have hosted a number of gatherings across the county with Investing in Place to share transportation concerns ranging from safe, walkable communities to completed streets, unsafe bus stops to dangerous bus drivers. Ultimately, Andrews asked Commissioners to think about what role First 5 LA can play as a convener and a catalyst to bring communities and systems together to improve the built environments. Following the breakout sessions, Commissioners gathered in the Board room to share their “aha” moments from either session. “I was especially touched by the man who told us he had been homeless as a child,” said Commissioner Jane Boekmann, referring to Ott. “That hit me really, really hard. I can’t even imagine. We live in this environment where we think everyone has the things that they need. I’d like to do everything we possibly could to help." 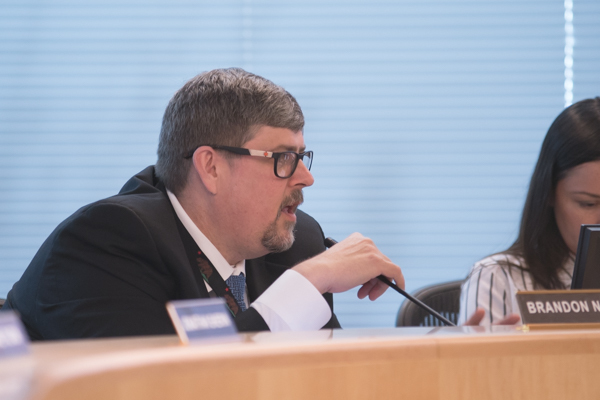 Perhaps it was Commissioner Joseph Ybarra, who rejoined the Board this month to represent the Los Angeles County Office of Education after the departure of Dayton Gilleland, who best summed up the impact of the innovative breakout sessions. “Let’s continue to think outside the box to meet the needs of students, kids and families,” he said.